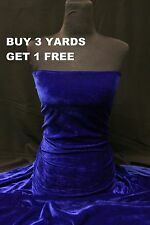 Price is for 1 Yard - 4 Way Stretch Lycra Velvet Material. see our wide range of fabric (print/plain viscose, chiffon, lace & plenty more plain & print material). Suitable for dress making, Crafts,Fancy dress etc. This truly is a excellent material that stretches very well there is more stretch in the width then there is in the length, this is a premium quality velvet that is smoother and heavier then most velvet, this fabric is known as ice velvet as it is very soft and smooth, when you wear this as clothing it is not see through so therefor need no dress lining material. This truly is a excellent material that stretches very well in the width there is more stretch in the width then there is in the length, this fabric is known as cracked crushed velvet as it is very soft and smooth, when you wear this as clothing it is not see through so therefor need no dress lining material. Printed Velour with a Plaid Design. Purple, Red & Black. 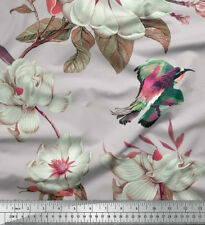 This is a lovely fabric for dress making, but would equally be well suited for soft furnishings. The colour of the fabric is more deeper Purple than it appears in the pictures. 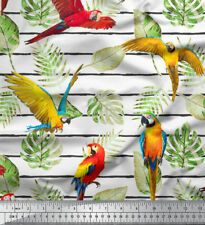 See our wide range of fabric (print/plain viscose, chiffon, lace & plenty more plain & print material). 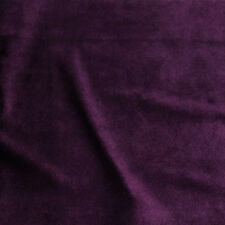 Price is for 1 Yard - Stretch Spandex Velvet Material. Suitable for dress making, Crafts,Fancy dress etc. Collection station availableColour: BlackWidth: 60"
Price is for 1 Yard - 4 Way Stretch Spandex Velvet Material. see our wide range of fabric (print/plain viscose, chiffon, lace & plenty more plain & print material). Suitable for dress making, Crafts,Fancy dress etc. STRECH velour. THE VELVET IS 1m LONG. THIS IS POLYESTER FABRIC. YOU CAN REQUEST A SAMPLE. 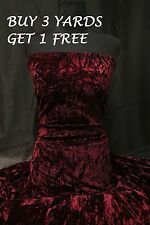 Top quality Velvet Velour In Polka Dot Print Fabric *New* REDUCED !!! 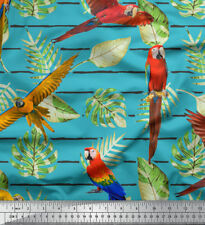 This fabric is a lovely soft poly velour fabric. It is bright red with white hearts. Great for a Valentine project, dance, fancy dress, crafts, cushions, dressmaking etc. One way stretch. Colour: PinkMaterial: 100% SilkWidth: 60"